After only a few injuries in Week 3, Week 4 ended with a number of superstars looking at significant absences. With the season rolling on, injuries will continue to pile up, but a few players will also return. With bye weeks beginning and the number of hurt players rising, here is everything you need to know about the Week 4 injury report. 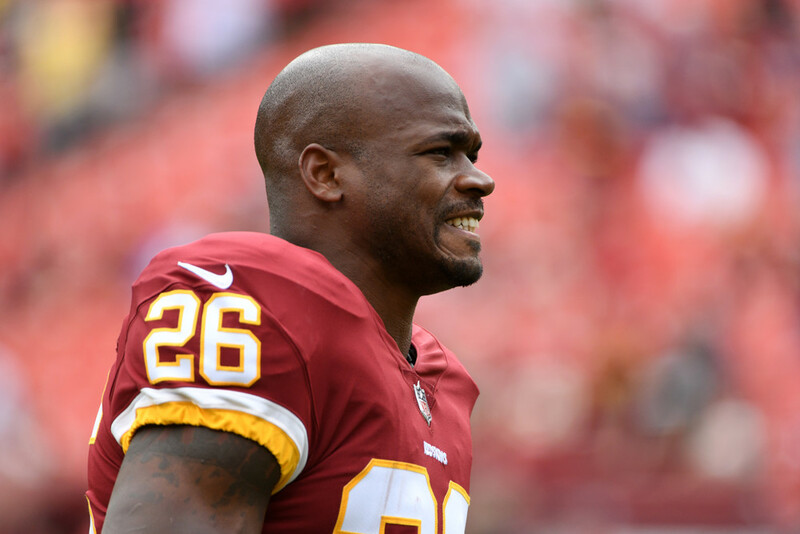 Reportedly dealing with a sprained right ankle, Adrian Peterson was seen in a walking boot on Monday. The issue doesn't appear to be serious, but Peterson has dealt with ankle injuries in his career. Unless he suffers a setback, the 33-year old should play for the Redskins next weekend. Rex Burkhead suffered a neck injury in the 4th quarter of Sunday night's game. The extent of Burkhead's injury has not been revealed, but the Patriots placed Burkhead on injured reserve. Burkhead could return later in the season, but the Patriots may choose to shut him down completely, due to the nature of the injury. After saying he would definitely play, Dalvin Cook missed Week 3 with a hamstring injury. Speaking on Monday, Cook said there is a good chance he will be ready for Thursday's game, but he followed up Tuesday by saying he remains truly day-to-day. Clearly dealing with a more significant injury than initially thought, Cook should be considered questionable at best to play on a short week. Missing his second game with a hamstring injury, Leonard Fournette appeared closer to game action after putting in limited practice this past week. Coach Doug Marrone called Fournette day-to-day on Monday, offering very little on his running backs true status. Fournette could come down to a game time decision for the third week in a row. Evan Engram sustained a sprained MCL early against the Texans, before the Giants quickly ruled him out. Engram should be considered week-to-week until a more concrete recovery timetable is released. Blocking tight end Rhett Ellison will fill in for the injured second year player. Missing Sunday's game with cracked rib cartilage, LeSean McCoy remains day-to-day according to coach Sean McDermott. However, McDermott did note that McCoy has progressed well, which falls in line with a report from Adam Schefter that said McCoy would only miss one week. Tentatively, the Bills should have their star running back for this weekend. After undergoing a clean up procedure on his knee, medical personnel expected Joe Mixon to miss 2-4 weeks. However, there are rumblings throughout the league that Mixon will miss only one game. Practice will by key for Mixon, but that tentatively puts him on track to play in Week 4. Leaving Cincinnati's game early, A.J. Green sustained a groin injury that cost him a good deal of Sunday's game. On Monday, head coach Marvin Lewis failed to comment on the situation, but Green said after the game that he expects to play in Week 4. In general, players tend to exaggerate on the optimistic side of injuries (see Dalvin Cook), so Green should be considered highly questionable until he puts in some work on the practice field. Potentially the most devastating injury of the week, Jimmy Garoppolo suffered a torn ACL late in the 49ers contest against the Chiefs. Garoppolo may have suffered MCL damage as well, but that has yet to be confirmed. Either way, his season is over and the 49ers will likely turn to their second-year quarterback, C.J. Beathard. Promising rookie Anthony Miller looks day-to-day after playing through a dislocated left shoulder on Sunday. The Bears eventually removed Miller from the game in the third quarter, with Miller clearly laboring on the field. The Bears cannot afford to play without any of their pass catchers, with Mitch Trubisky disappointing to start the year.